Burmester 113 review | What Hi-Fi? It’s easy to underestimate Burmester’s 113 digital-to-analogue converter. Those compact dimensions – just 6cm high and 20cm wide – and that comical tooth-shaped multi-coloured indicator may suggest a less than serious product. Don’t you believe it. Both Burmester’s track record and that price are strong evidence that this is ‘proper’ hi-fi, even though the price is very much entry-level for the brand. There’s the standard trio of conventional digital inputs: USB, optical and coaxial. As usual, there is some discrepancy between the inputs when it comes to the upper limits of signal that each can cope with. The optical input is limited to 24bit/96kHz material, while both the USB and coaxial inputs will take the full-fat 24bit/192kHz source material. In the case of USB, you might have to install new software drivers on your computer. It’s a simple process that takes mere minutes to complete. 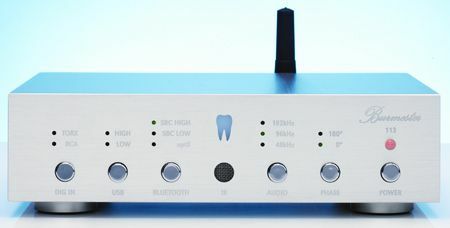 The 113 DAC offers the user the choice of three internal sample rates for the digital signal: 48, 96 and 192kHz. The sonic differences between the varying rates are subtle enough to come down to personal taste and system balance. We ended up leaving the 113 on the 192kHz setting in our Naim NDX/Bryston BP26/4B SST2/ATC SCM 50 set-up. It's an odd selection of frequencies: we would have expected the choice of 44.1kHz – CD's sampling rate – and all its multiples. As it is, signals with these sampling rates have to be converted to fit the ones chosen, and that's bound to introduce some processing errors. The final way to get a data stream into this converter is via Bluetooth. Standard Bluetooth is an option, as is the far more sonically satisfactory aptX version. While it’s possible to mount the 113’s little Bluetooth antenna horizontally, the DAC also comes with a right-angled adaptor that makes the aerial stand vertically, improving reception quality. The Burmester’s connectivity is good. Along with coaxial and optical digital outputs there are also balanced and single-ended analogue outputs. We preferred the sound through the balanced XLR because of its bolder character. The differences aren’t make or break, so if your system can’t use balanced connections, don’t worry. As we’ve come to expect from Burmester, the 113’s build quality is excellent, with each control oozing solidity. This may be a pricey product but it feels like a precision instrument that’s worth every penny. Our only complaint is that the supplied remote-control handset is a complex system unit rather than one that’s specific to the DAC. This means there are many more buttons than anyone is likely to need, and it’s not always clear which needs to be pressed. Give the 113 some time to warm up and its sonic performance proves beyond any doubt that it isn’t some piece of audio jewellery. Regardless of input, this converter has a powerful sound that belies its dimensions. Feed it the likes of Hans Zimmer’s The Dark Knight Rises soundtrack and you’ll hear a sound of impressive authority. Low frequencies are immensely punchy and lack nothing for reach and power. Yet, despite that muscle, there’s plenty of agility and definition. Out of this firm foundation grows a clear and insightful midrange that’s able to reveal the intensity of Leonard Cohen’s croaky vocals on Going Home. The level of detail is impressive, as is the confident way information is organised. Stereo imaging is expansive and well layered, and even rhythmic precision – an area where a lot of high-end kit tends to underplay things – is decent. Top it all off with a nicely even tonal balance which has just the slightest touch of top-end sweetness and you have a product that will be easy to enjoy for years to come, not to mention work well in a wide range of systems. Why the four-star rating then? While the 113 is undeniably talented, its sonic presentation is always on the bold side. This makes everything sound exciting and energetic. Music isn’t always meant to be exciting: it can be sad, moving or relaxing, and this Burmester doesn’t fully appreciate that. Listen to Arvo Part’s Tabula Rasa and a less boisterous approach is called for. This, the 113 can’t quite manage – and so it loses some emotional impact in the process. The 113 may not be to all tastes but it is another strong product from the German brand. If you’re lucky enough to be able to buy at this price, it’s good enough to demand a serious audition.